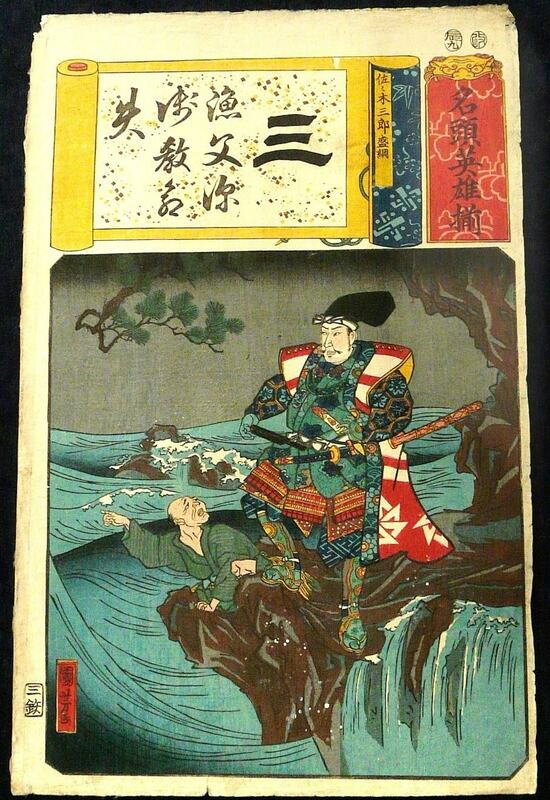 UTAGAWA KUNIYOSHI was born in 1797 and died in 1861. He was born the son of a silk-dyer with the given name Yoshisaburo and had a love of drawing at a very young age. It is thought that he had training with Katsukawa Shuntei before he joined the great Utagawa school at 14 years of age. The head of the school at that time was Toyokuni (1769 to 1825) who gave the new student the name of Kuniyoshi which was a mixture of the master’s and student’s name. 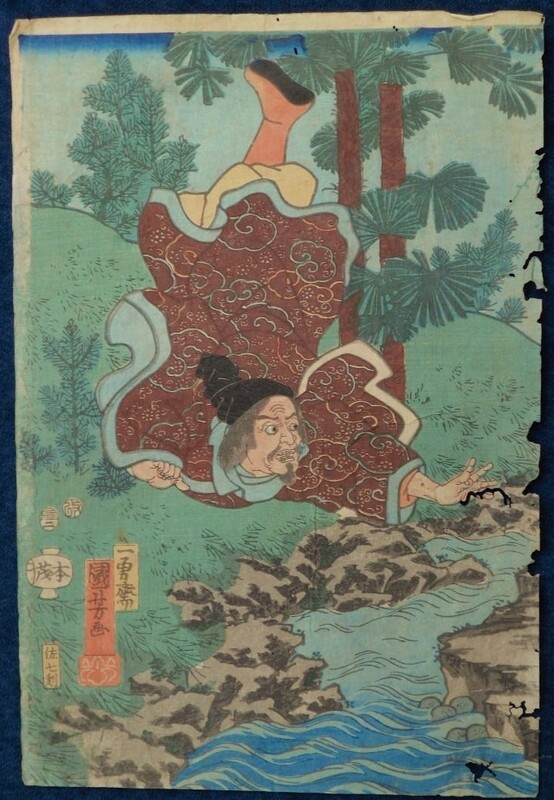 It took Kuniyoshi until 1827 before he gained any commercial success with a series of warrior scenes but once started he flourished and his woodblocks encompassed a wide range of subject matters including ghost stories, beautiful women, actors, landscapes and even a few comic adventures. He died in 1865. VERY FINE DIPTYCH CREATED OVER THE PERIOD 1842 to 1843. 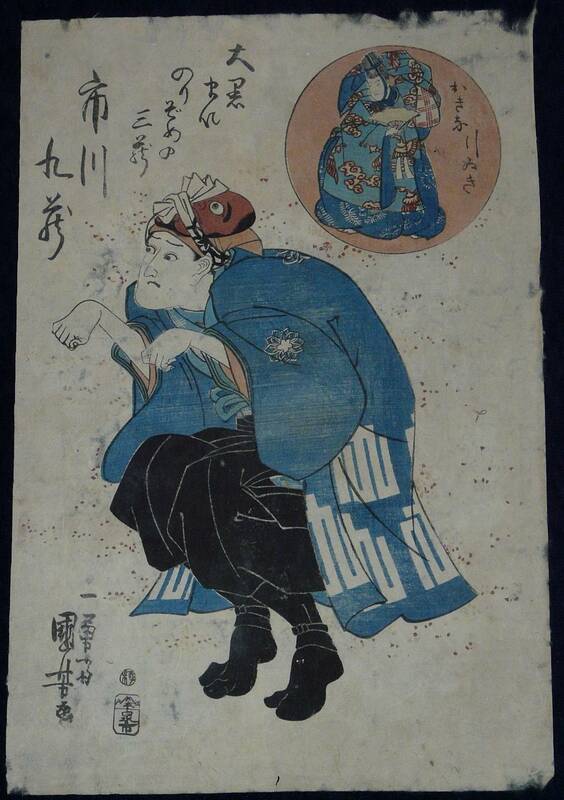 SIGNATURE: Ichiyusai Kuniyoshi Ga on Both Woodblock Prints. DATED: 1842 – 1843 Recorded Scene from this period. 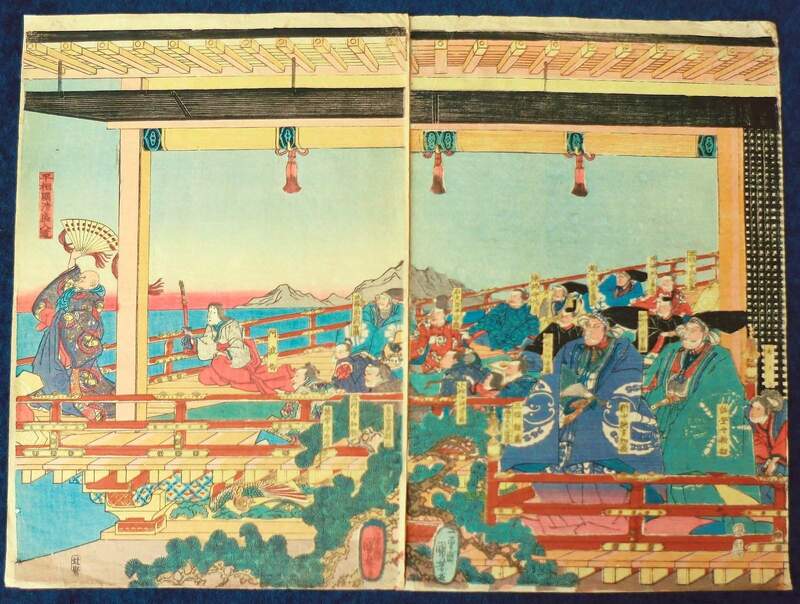 CONDITION: Very good for its over 173 years of age, not backed or joined, still in two separate woodblock prints. NOTE: Pictures show each scene separately and as a diptych below. 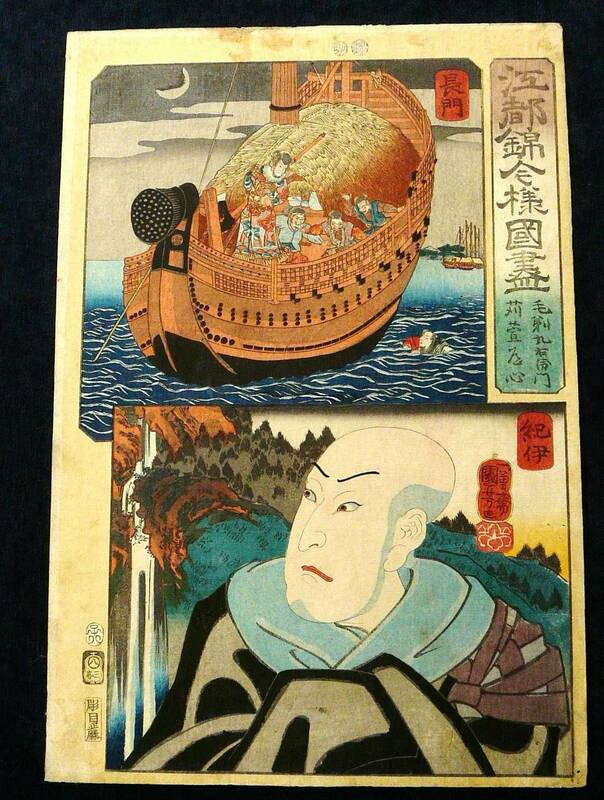 Shows an historic event in the life of the Legendary Japanese Warrior Minamoto no Yoshitune. DATED: Enshû-ya Matabei Publisher’s Seal Dated 1845. CONDITION: A little over average for its over 171 years of age, margins trimmed and joined in the centre for display. SIGNATURE: Ichiyusai Kuniyoshi Ga with Kiri Seal Below in the right of the scene. DATED: 1852 to 1853. Displays the Aratame Censor Seal used 1853 to 1857 in the left margin with publisher’s seal below. CONDITION: A little above average for its over 159 years of age. SIGNATURE: Ichiyusai Kuniyoshi Ga with Kiri Seal Below in the lower right of the scene. DATED: 1860. Displays the Aratame Censor Seal for the year 1860 above the artist’s signature. 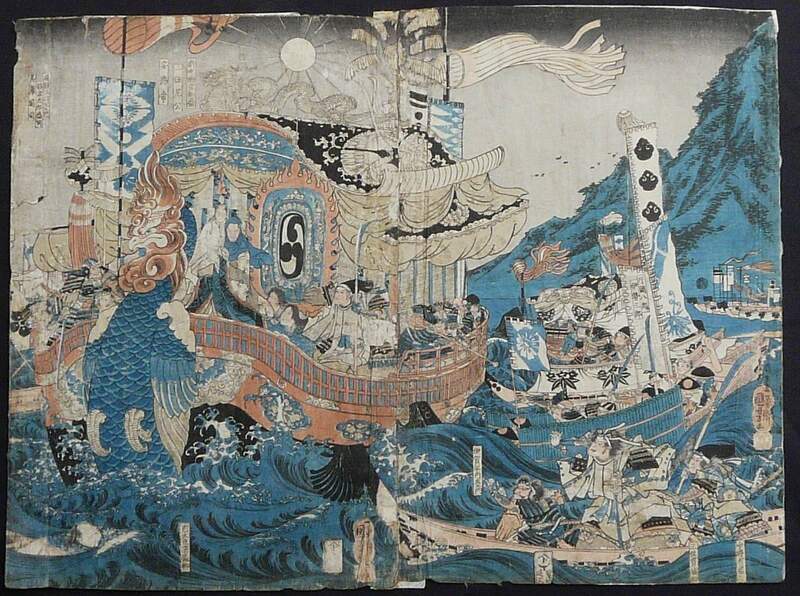 CONDITION: Average for its over 156 years of age, margins trimmed, some minor soiling and old washi backing has helped to conserve this rare woodblock print. 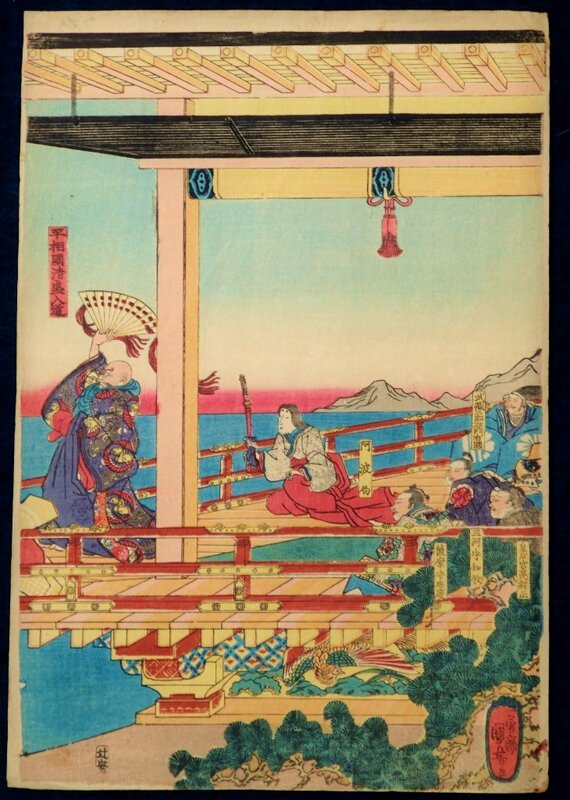 SIGNATURE: Ichiyusai Kuniyoshi Ga with the Red Kiri Seal Below in the left of the scene. DATED: 1854 to 1857. Displays the Two Aratame Censor Seals, one round and one oval only used between 1854 and 1857 in the left of the scene. CONDITION: A little under average for its over 190 years of age, margins trimmed and some wormhole damage to right side of woodblock print which could be disguised when framed. 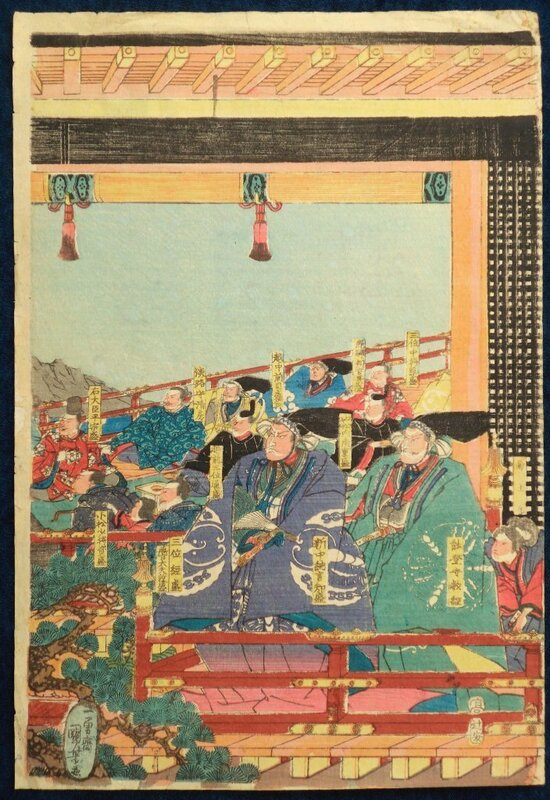 SIGNATURE: Kuniyoshi Ga in red panel in lower left of scene. DATED: 1854 to 1857. Displays the Two Aratame Censor Seals, one round and one oval only used between 1854 and 1857 in the top margin on the right hand side. CONDITION: Far above average for its over 159 years of age with full margins and only a very few minor signs of the years. 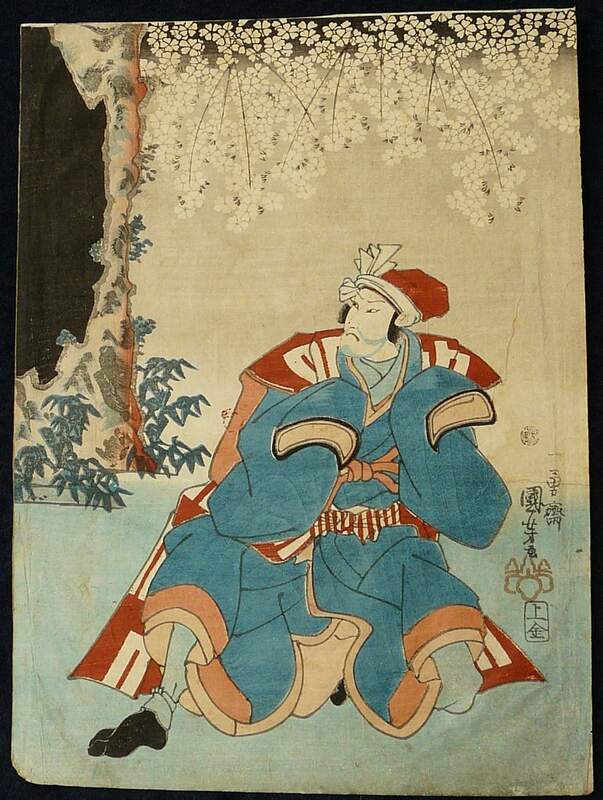 SIGNATURE: Ichiyusai Kuniyoshi Ga in the form which was only used during the 1830s and before. DATED: 1830 or before. Displays the first of three Kiwami Censor Seals used from 1790 to 1845 alongside the signature in the lower left of the scene. CONDITION: About average for its 185 years of age with some very minor soiling and thinning of washi near the edges.